Jair Bolsonaro was elected president of Brazil on Sunday. The far-right congressman received more than 55 percent of the vote. His opponent, ex-São Paulo Mayor Fernando Haddad of the Workers’ Party, received less than 45 percent of the vote. Bolsonaro has already had a phone call from Donald Trump congratulating him on his victory. As incomprehensible as Trump’s election was and still is, Bolsonaro’s is an order of magnitude worse. This is an epic tragedy for Brazilians, their young democracy, the Amazon, and all of Latin America. Human Rights Watch issued a statement calling on Brazil’s judiciary and other institutions to resist any attempt to undermine human rights, the rule of law, and democracy after the election of Bolsonaro, whom they call a “pro-torture, openly bigoted member of Congress”. 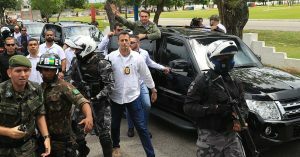 Far-right congressman Jair Bolsonaro—often called “Brazil’s Trump”—has won over many voters by painting a picture of a dark Brazil at war—with criminals, corrupt politicians and leftist ideas. But many others fear that electing a populist provocateur notorious for praising Brazil’s 1964-85 military regime and foreign autocrats including Donald Trump, Peru’s Alberto Fujimori and Augusto Pinochet of Chile will send the country into the dark ages.